You can control the Hansgrohe Metris Select and Talis Select kitchen mixers with the touch of a button, allowing you to turn the mixers on and off with barely a touch of your fingers, back of your hand, forearm or elbow. While Hansgrohe is known for being a leading bathroom specialist, kitchens have become an important focus for the company over the last few years – making the organisation a key authority on all that is design and function in both the bathroom and kitchen space. 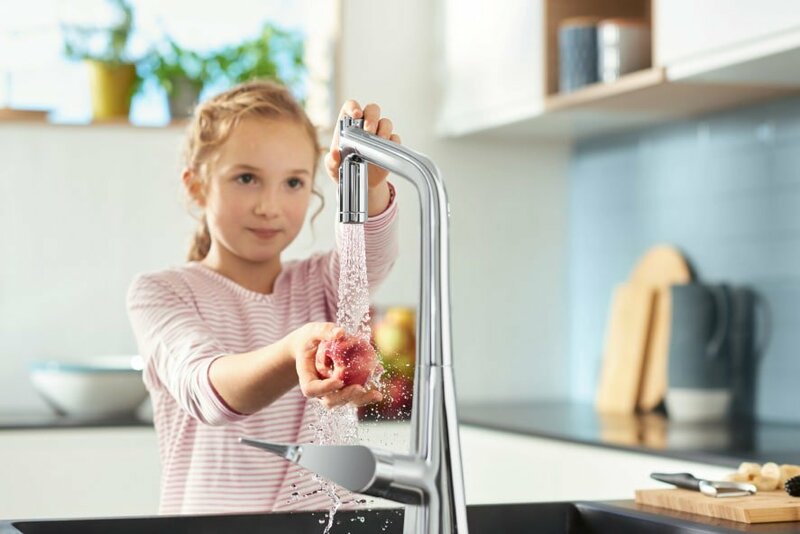 In line with this, Hansgrohe has just launched a new range of state-of-the-art stainless steel and granite sinks, as well as their innovative range of kitchen mixers – the Metris and Talis Select. This launch has brought kitchen sinks and taps to the SA market that have never been so pioneering in both form and function. The timeless wide design and hand-brushed L-shaped basin rim makes the Hansgrohe sink a striking feature in any kitchen, with the minimalistic design blending perfectly with the ambience of a modern kitchen. Choose between the five different sink sizes in stainless steel as built-in, undermount or flush mount to combine with a premium Hansgrohe kitchen mixer for a perfect fit. The granite sinks are also available in five different sizes in either undermount or built-in with three different colour options, graphite black, stone grey and concrete grey. To compliment the stainless steel and granite sinks, the aesthetic mixers offer an elegantly discreet design, without compromising on functionality. This is perfect for an interior design concept which views the kitchen more as a living space rather than a work area. With the Hansgrohe Metris Select and Talis Select kitchen mixers, you can control the water at the touch of a button. The select button makes your life more convenient by allowing you to turn the mixers on and off with barely a touch and within an instant – with your fingers, back of your hand, your forearm or elbow.